touristplacesinindia offers complete information on the city of Shimla, fast facts on Shimla, history of Shimla, best season to visit Shimla, climate and clothing in Shimla, Shimla hotels, places to see in Shimla, worth visiting places in Shimla, events and festivals of Shimla, accommodation options in Shimla, tourist attractions in Shimla, excursions form Shimla, hotels in Shimla, accessibility of Shimla, tour packages for Shimla, holiday offers for Shimla, how to reach Shimla through air, rail, road, luxury hotels and budget hotels in Shimla. Shimla is a captivating hill station and also the capital city of the state of Himachal Pradesh. It is also lovingly referred to as the �Queen of the Hill Stations� owing to its unparalleled natural beauty. The entire town of Shimla is replete with forests of pine, rhododendron, and oak and experiences pleasing summers and cold, snowy winters. Besides, it is also highly acclaimed for its buildings styled in tudorbethan and neo-gothic architecture evocative of the colonial era. It was the most sought-after summer getaways and the summer capital of the erstwhile British Raj in India as well. Shimla also ranks high among the tourist destinations of North India and is visited by hordes of tourists all the year round. There are lots of tourist attractions in Shimla that you can come across during your tour and some of them to mention are Himachal State Museum & Library, Viceregal Lodge & Botanical Gardens, Indian Institute of Advanced Studies, The Ridge, The Mall, Summer Hill, Glenn and Taradevi Temple. Tourism in Shimla also involves various adventure activities such as skating, trekking, fishing, ice skating and camping. The old world charm can be apparently felt in its old colonial buildings and several beautiful structures. Shimla has been endowed with all the natural bounties and has a beautiful location, surrounded by green hills and snow clad peaks. If you are looking for a break from the usual chores, then you can surely visit this place as it is ideal for those who want some peace of mind and privacy amidst a scenic locale. 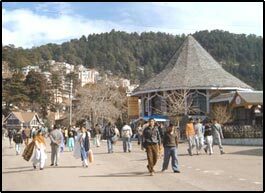 Shimla has fine lodging options for the tourists dropping in here for spending vacations. There are ample hotels warranting a great stay to the guests and could be classified into the various categories such as heritage hotels, four star hotels and three star hotels. Besides, you can also choose from a number of other hotels that are located in Shimla and make for ideal options for enjoying the stay to the fullest. Choose from any category of the hotels and expect the best in terms of service and hospitality. Shimla is also well-connected by air, rail and road transport and you can reach here from any major destination of India. Shimla has its own airport but for long distance journey, Delhi and Chandigarh would be good options. Shimla is linked with Kalka which is connected with all the major destinations of India. The road transport is also commendable and one can reach here by the motorable network of the national highways from the key destinations of North India such as Chandigarh, Mandi and Delhi. Know more about Shimla by browsing through the site touristplacesinindia.com, which offers valuable tourist Information on Shimla.